Gorgeous Floral Loveseats and Floral Chairs! I love flower print chairs! Floral loveseats, settees and floral chairs are absolutely perfect for a girly woman’s living-room! The can give a home that unequivocal ‘woman’s touch’ and they can also brighten up your day! *This one in the picture above, for example, is gorgeous! 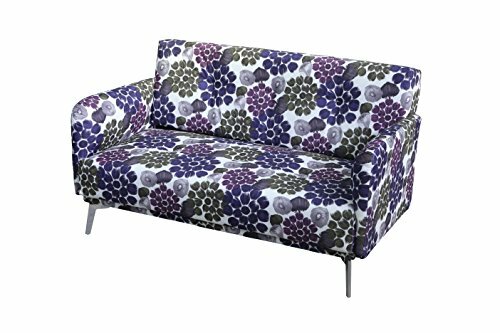 Comfortable, colorful, fun and very cheerful floral armless love seat! Will brighten up any room immediately! Flowers represent love, compassion, commitment, and beauty! You can place your cute love seat next to a window and some real plants and flowers to create a pleasant and relaxing atmosphere! Anything with flowers is very cheerful and flower print furniture is absolutely lovely! A cute flower print loveseat or floral chair can make a wonderful and sweet gift for your grandmother, mom, sister or any woman you love! Cool Floral Loveseats and Settees! How lovely is this one?? What a fun floral design! Great furniture gift idea for a girly and happy lady in the family! 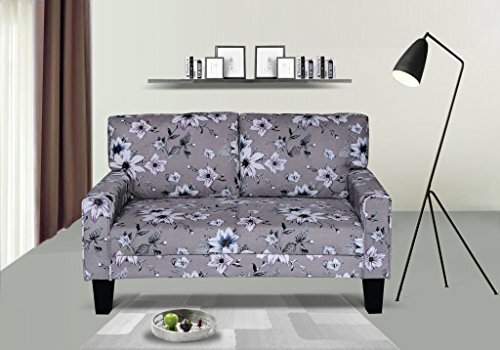 I couldn’t help but smile when I saw this gorgeous, very affordable and modern floral settee! The flower prints are so cute! Will immediately add a ‘splash’ of colors to your living-room! 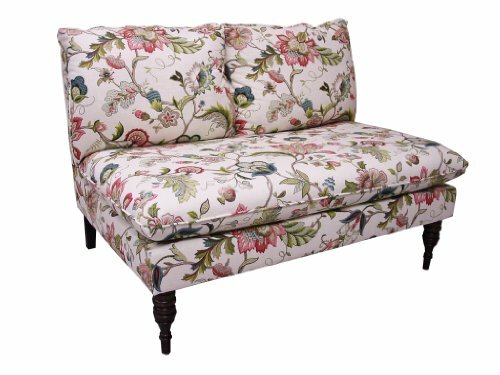 This cute floral settee is not only beautiful to look at, but also very comfortable to use! Easy to assemble and sturdy! Another cute, fun and cheerful modern floral settee for sale! This one begs to be near a window and by some beautiful plants! Perfect to create a fun and bright reading corner in your living-room! It is perfect to complement a white living-room! Will definitely look lovely by a window! 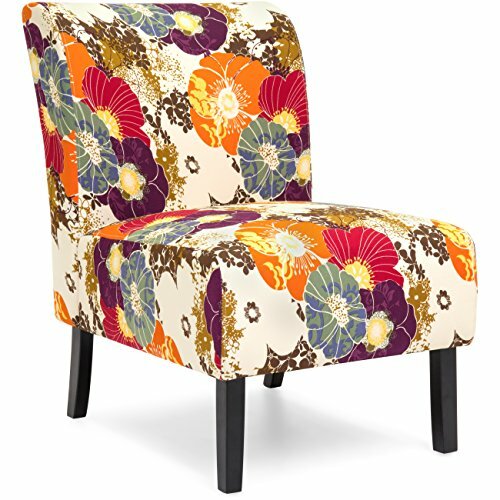 Very Cool Orange, Red and Gray Floral Fabric Chair! 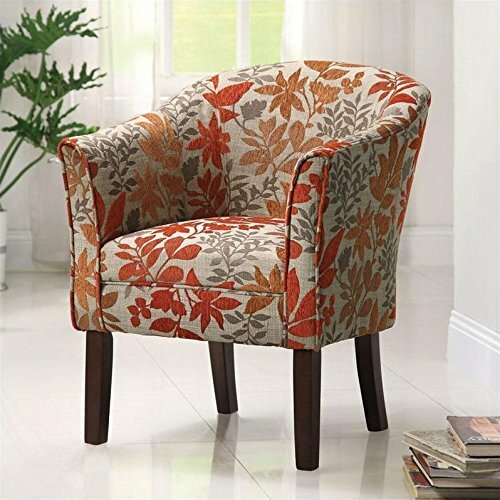 Orange is a very modern color to have in your living-room and this cute orange, red and gray floral print fabric barrel back accent chair is very charming! It’s amazing how fun and bright colors have the power to brighten up and cheer up any ambiance! It is also very comfortable to use! 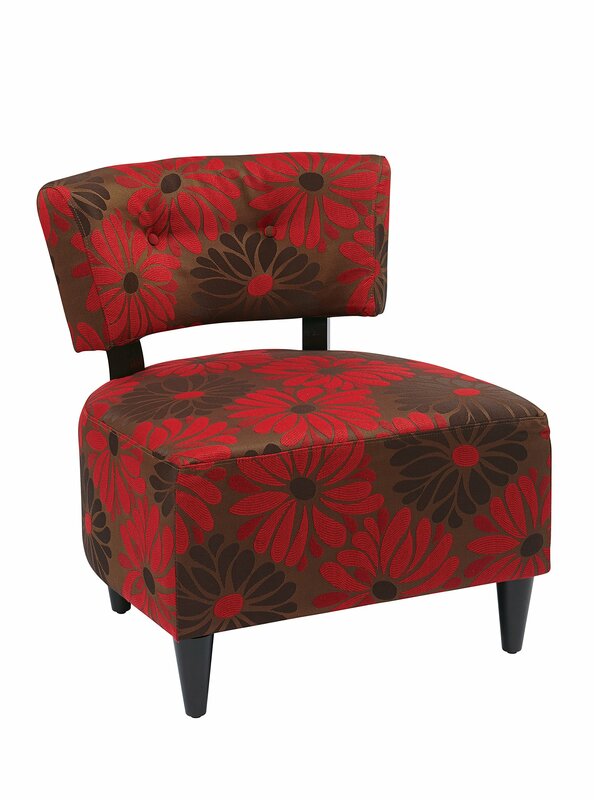 Another beautiful, modern, affordable and fun flower print chair! You can definitely buy at least two of them and create a fun floral chair set in your living-room! Just add a nice round table in the middle if you want! Also perfect to place on a corner, by a nice lamp or a bookshelf. 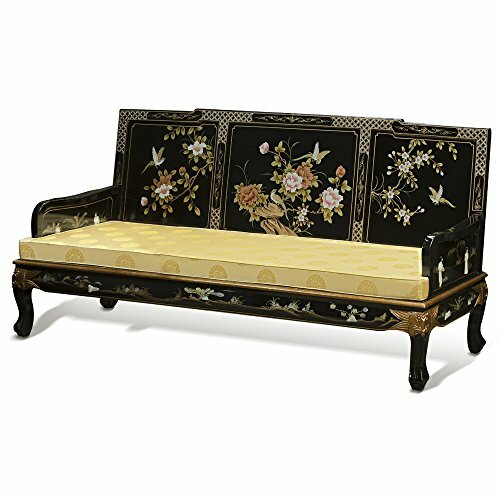 I had to show you this oriental floral sofa too! It is a gorgeous oriental style birds and flowers motif sofa chair! It has a beautiful and elegant shiny lacquer finish! Cute Floral Chairs for Home! Super stylish and elegant bright RED and brown floral print accent for sale! You can get a couple of these and create a nice ‘floral corner’ in your living-room! 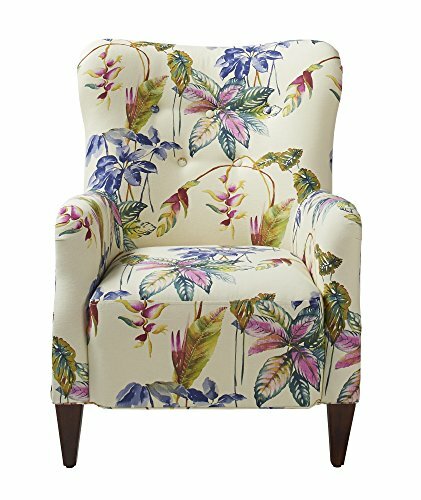 The Most Beautiful Floral Print Accent Arm Chair! In my opinion this is one of the most beautiful and feminine floral print chairs being sold! The color combination is so cheerful! I would definitely have two of these side by side in my living room with a nice and cute end table in between them! 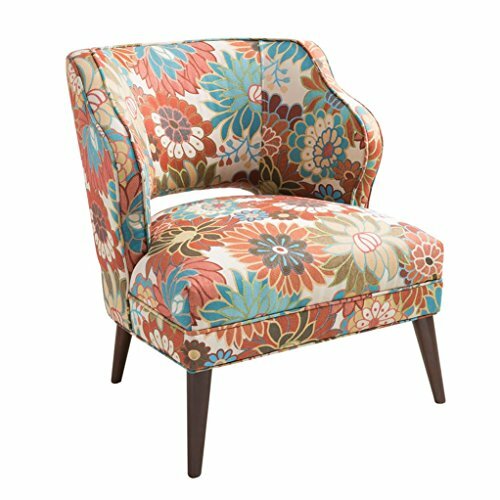 Very Cheerful Blue and Orange Floral Pattern Armchair! This has got to be the most cheerful floral armchairs around! How’s that to brighten up your living-room? I would definitely get two of them and create my own set! Perfect to have next to your window and create a bright and cheerful ‘reading corner’! My Favorite Cute Chairs for the Home! The Most Fun Chairs for Sale!